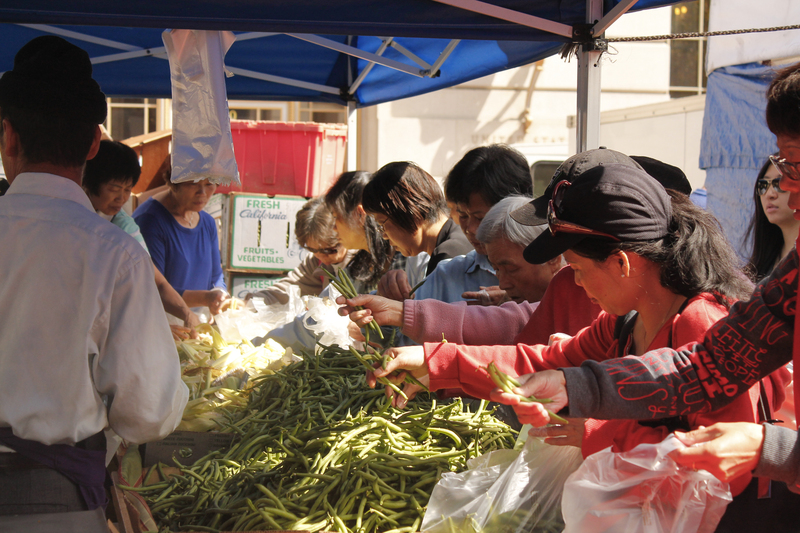 During a rare hot summer day in San Francisco, farmers’ stands fill United Nations Plaza. “Dollar a pound, mix and match!” some yell. It’s a typical Sunday at the Heart of the City Farmers Market. The low prices and abundant produce make it easy for a shopper to forget that a four-year drought is threatening the future of agriculture in California. But you don’t have to remind Grace Teresi, who has to count every drop she uses on her San Juan Bautista farm not to run out of water. Like Teresi, many farmers are simply irrigating less. Some are leaving their fields fallow or letting them dry. This means fewer jobs, less produce and higher prices. “We are in trouble, aren’t we?” Teresi says. California produces 70 percent of the value of all of the fruit and tree nuts produced in the U.S. During the past year, this production dropped by an estimated 20 percent, according to the U.S. Department of Agriculture. With less and less surface water available, farmers have no choice but to pump groundwater, using costly wells they have to drill on their land. The main providers of surface water, the State Water project and the Federal Central Valley Project, which normally provide water to almost 4 million acres of agricultural land, have in the last two years pumped no more than 5 percent of the water farmers usually buy. Teresi, of Miramonte Farms, about 20 miles from Salinas, considers herself lucky to have paid $40,000 for her 1,000-foot deep well a few years ago. Now she would have to pay double for the same job and farmers need to drill deeper and deeper to find any water. “It was a good investment,” she says. With depths ranging between 100 feet to 2,000 feet or more, a well today can cost as much as $1 million dollars in Fresno County. Because it has a viable well, Teresi’s farm is not affected by the drought as badly as others, even though Miramonte no longer gets surface water. Those who can only count on surface water are out of business by now, she says. 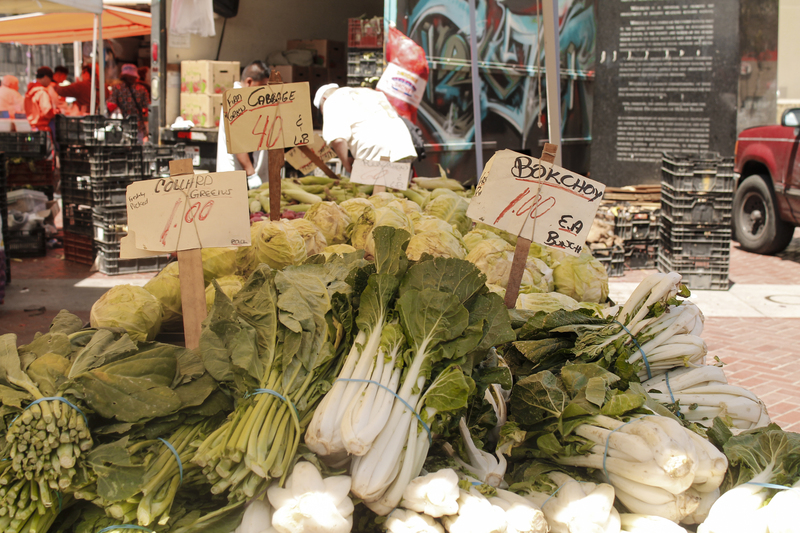 Instead of raising prices, Miramonte Farms opted to become smaller and plant less. In place of watering three times a week, as it has for years, Miramonte only turns the sprinklers on every seven days. As a result, the fruits and vegetables are firmer and less juicy, but as good as before, if not better, because they are more concentrated, Teresi says. But they do look a bit different. Teresi scrubs a peach clean with the rag she has tied around her waist. The peach’s skin is so dry it resembles a crust. But, like people, peaches shouldn’t be judged from their appearance, Teresi says. The drought and the warm weather accompanying it, Teresi says, “messed up” all their crops. With a rainless, warm winter, the trees skipped their dormancy period, the plant equivalent of hibernation. “They don’t know if it’s summer or winter,” Teresi says. Her garlic and oranges were “horribly small.” The apple trees, which usually don’t need any irrigation other than rain, last year needed water for the first time, she says. June was the hottest month on record in California (about 10 degrees above normal), according to the USDA, boosting irrigation demands. Rainfalls during the past year, have been 70 percent of the historical average, while the snowpack, as of April, was 5 percent of the historical average, according to the state Department of Water Resources. Teresa Martinez needs a new well. Hers, at Martinez Farms in Fresno, is drying up. But farmers have to wait two or three months for a well driller, which will cost $50,000 to $70,000. 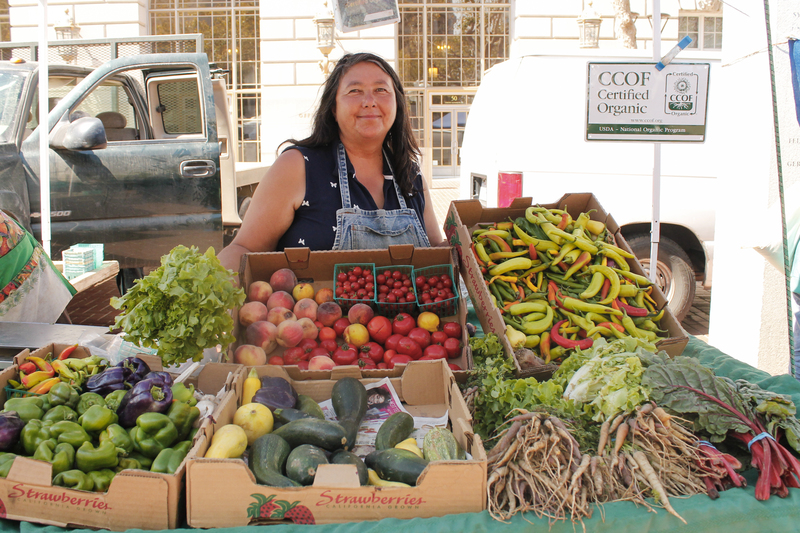 It’s a lot of money, and to make up for it, Martinez Farms will have to increase its prices at the farmers market, she says. Martinez is one of the many farmers who don’t receive any surface water from the state or federal projects. She could, but she says it’s not worth it. Even if she applied, they only would deliver her $5,000 worth of water, which is not much these days. The Federal Central Valley Project, which usually supplies water to nearly a third of California’s agricultural land, allocated zero water this year and last, leaving 3 million acres dry. Water allocation works on a seniority level, so the first farmers to see their water supply cut were those with the most recent contracts, or junior rights holders. As of June, for the first time during this drought, senior water rights holders had their supply curtailed as well. Packing up after a busy day at the Alemany Farmers Market, Lujan Farms manager Tony Ramos says his farm paid $75,000 to drill its well. Water prices went up two years ago, he says, and it now costs $7,000 to irrigate 10 acres. “There’s nothing you can do about it,” employee Armando Vazquez says. They either pay, or let more trees dry. The farm already sacrificed many of its orange trees. Two years ago, to have good fruit they would irrigate their crops seven times. Now they can afford to do it only twice. Vazquez says their fruit was better before. “You treat your trees good, they give you good fruit,” he says. Even if the farm has a well, Vazquez says they need to be careful not to pump too much, because there’s no way to tell when the water will run out. University of California, Davis hydrogeology professor Graham Fogg said hundreds of thousands of wells have been drilled in the Central Valley, creating a risk of overdraft, which is when the pumping exceeds the rate of replenishment, worsening the condition of an already overtaxed aquifer system. An aquifer in overdraft can lead to many negative consequences. In the worst cases, the aquifer simply dries. Even if there is some water left, the quality may deteriorate and the land around may sink, a phenomena already seen around the Central Valley, says Fogg. 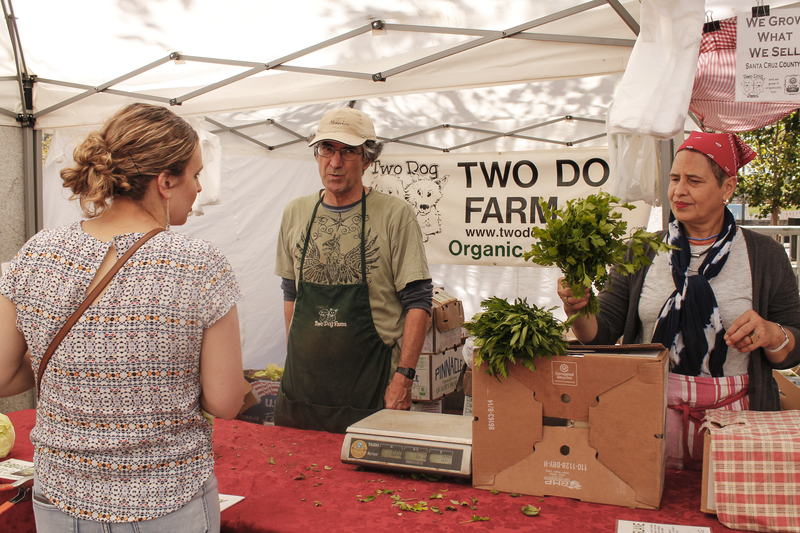 Mark Bartle of organic Two Dog Farm says the drought hasn’t affected his operation. He practices “dry farming” so water has never been a problem. Four-fifth of his acreage is already dry. His irrigation technique is very different from what others have been doing simply to save water. To dry farm, a farmer needs the right soil, the right weather, the right product and the right market, Bartle explains. “It’s a lot harder than watering a little less,” he says. It’s a matter of managing the soil, using systems to trap the moisture already in the soil. The water Bartle uses comes from the State Water Project, so, even if his farm is doing fine, every year he wonders if his water supply is going to be shut down. “Well water is our back-up plan,” Bartle says. If farmers employed more efficient and modern irrigation technologies, agricultural water use could be reduced by 17 percent to 22 percent, or 5.6 to 6.6 million acre-feet of water annually, according to the Pacific Institute. An acre-foot is the amount of water that would cover one acre, about the size of a football field, to the depth of a foot, about 326,000 gallons. In 2015, the drought reduced the availability of surface water for farmers by about a quarter, or 8.7 million acre-feet, resulting in groundwater pumping increasing by an estimated 6.2 million acre-feet of water, for a net loss of 2.5 million acre-feet. By way of perspective, that’s about the amount of water that 2.5 million suburban households would use in a year. If all farmers applied efficient irrigation methods, the gap could be closed, decreasing the need for groundwater pumping. According to the California Department of Water Resources, in an average year, agriculture irrigates about 9.6 million acres using 34 million acre-feet of water. That is about 80 percent of the state’s developed water supply. If 2016 is another dry year, there will be more cuts to the agricultural water supply, and those who will suffer the most will be farmers and farm workers, UC Davis professor emeritus Richard Howitt says. While consumers might find their fruit and vegetables smaller and perhaps 10 percent more costly, a continued drought will add to the toll of 17,000 farm jobs lost in 2014. It would lead to additional overdraft of aquifers and lower groundwater levels, drying up wells, increasing pumping costs and sinking land. Howitt says the state needs to get better at managing water to survive another year of drought. A place to start would be replenishing the groundwater. It needs to be put back, Howitt says, “It’s like a bank account.” Without replacing the groundwater, the water table will keep on falling. Teresi is hopeful but cautious. Even if it starts raining again, she says it will take many years to get the water table back where it was. This entry was posted on August 13, 2015 by Bay News Rising and tagged agriculture, Alemany Farmers Market, california, City Farmers Market, Davis, Drought, dry year, Farmer, Farmers, farmers market, Federal Central Valley Project, Fresno, fruit, market, Martinez Farms, Miramonte Farms, rainfalls, San Francisco, San Juan Bautista farm, State Water project, summer, tree, U.S. Department of Agriculture, United Nations Plaza, University of California, vegetable, water, water supply.